In one recent case, an elderly man had made his son his Attorney. He became incapacitated due to advanced dementia and was cared for by his son over a period of several years. The son used his father’s money to ‘pay’ himself and his family a wage. When the man moved into a residential home aged 95, another son became concerned about his father’s finances. The other son made an application to the Court of Protection. Unfortunately the Attorney had not kept proper records of his dealings with his father’s money. Nor had he kept accounts of why he was paying himself or his family. Before the Court, the Attorney agreed that he should be replaced by a panel deputy, i.e. a court-appointed substitute. The Court also ordered that he repay some of the payments to his father. In this case, the failure to keep notes of what was done and the payments made with the ‘donor’s’ money was fatal. It illustrates the importance of an Attorney keeping a record of payments and where necessary receipts and invoices, as well as basic accounts. If not, it could prove expensive. 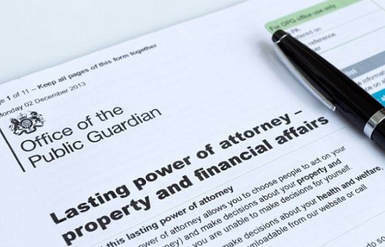 For more information about Lasting Powers of Attorney, click here.